South Korean Chun In-gee has posted her fourth runner-up finish of the 2017 LPGA season, as her search for her first win of the year continues. Chun lost in the first playoff hole to Ariya Jutanugarn at the Manulife LPGA Classic in Cambridge, Ontario, Canada, on Sunday (local time). Lexi Thompson was another player involved in the sudden-death affair, and Jutanugarn beat both with a long birdie putt. The three players finished the regulation tied at 17-under 271 at the par-72 Whistle Bear Golf Club. They went back to the par-four 18th to start the playoff, and Jutanugarn was actually in the worst position off the tee, after pulling his drive into the rough on the left side of the fairway. The Thai found the center of the green from the position, while Chun, hitting from the fairway, landed her second shot farther away from the hole than Jutanugarn. When Thompson left her second shot short of the green, it came down to Chun and Jutanugarn. Chun missed her attempt, and then Jutanugarn rammed her putt home to clinch her first win of 2017 and sixth of her career. Chun now has six top-10s in 11 starts in 2017. She has been on a roller coaster of late, as the results of her four previous tournaments were -- missed cut, tie for 33rd, second place and missed cut. The LPGA Tour now has 14 different winners in 14 LPGA events. Thompson was bidding to become the first multiple winner in 2017. 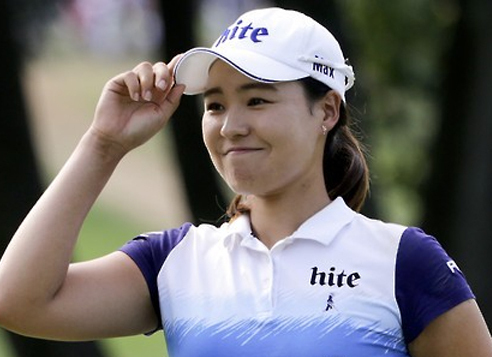 Chun, the 2016 LPGA Rookie of the Year, was attempting to become the eighth different South Korean to win in 2017 and second straight after Kim In-kyung a week ago. Chun mixed in four birdies with two bogeys in regulation in the final round, with two of the birdies coming down the stretch at the 15th and 16th. Thompson was the overnight leader but bogeyed her final two holes to drop into the playoff. With this victory, Jutanugarn, who shot a 69 in the final 18 holes, will replace idle Lydia Ko as the new world No. 1 in women's golf.